I am totally guilty about delaying this post. It is now March. Wow, can't believe it's already April. 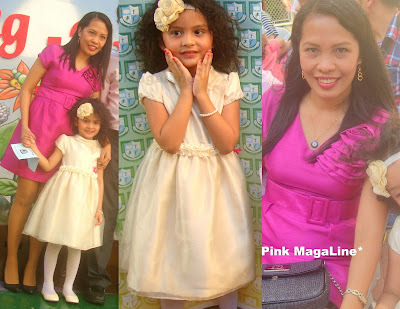 Okay, I am finally publishing this.. a short entry on my daughter's moving up ceremony. She just finished her first year in preschool. She passed kinder 1 or junior casa 1 as they call it in Integrated Montessori Center. Next year, she's good to enroll for kinder 2 or junior casa 2. Congratulations my dear for taking home Excellence in Comprehension. The award you got isn't a major one but it's enough to make baba and mama proud. We love you so much. My in-laws said I don't look pregnant in my pink satin dress and hubby (cropped in the photo) was more preggy-looking than me. Funny. Haha. My daughter's class performed 3 numbers as part of the moving up ceremony. They sang the IMC Hymn and danced into 2 Hi5 songs. Here's the cutest one so far. Enjoy!!! But you really do not look preggers in that dress! :D And your daughter is just sooooo pretty! Congrats Merida! Good luck little girl and God bless you. Congratulations baby girl! Mom must be really proud of you!! Way to go! You have a very pretty little girl sis. :) Congrats! Ang pretty ng daughter mo :) The first thing din na I noticed about her hair is like Merida's hehe.